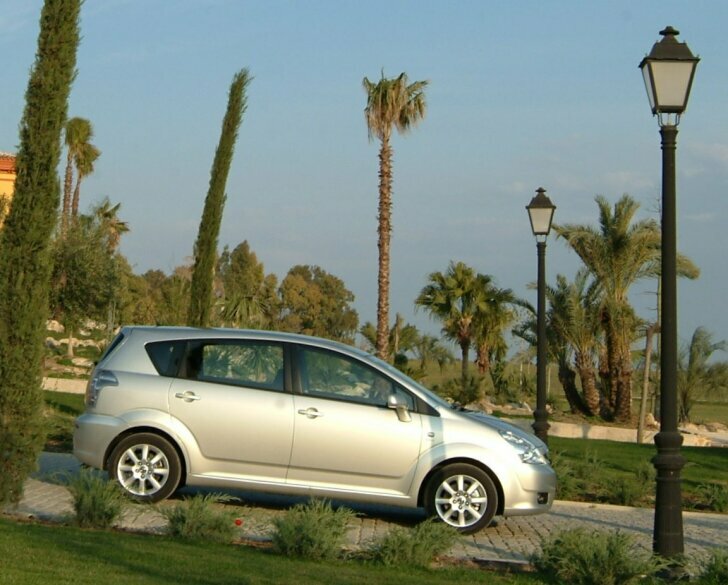 Review | Toyota is very successful with its "Verso" models. Using that name the manufacturer offers extra spacious versions of nearly all models. A Verso is more than just an estate car with an extra backseat, it is a fully fledged MPV. The Corolla is the most popular Toyota and now that model is available in Verso outfit. Only the name remained, because on all levels this MPV goes further than ever before. One can still buy them: those big ugly 7 seater people carriers where everything is about space and the driver is almost forgotten. How different the new Corolla Verso is! When entering the car the Verso doesn't only impress with space, it is also clear that during design the driver always played a central role. The driver's seat feels like that of a sporty hatchback, not an MPV. Toyota did not just focus on ergonomics, at least as much attention went into design. The dash is even more beautiful than that of the normal Corolla! The "Optitron" gauges comprise of red hands which seem to float on a grey/white background. The centre console is finished in an aluminium look. The display of the climate control is housed in a gorgeous half translucent aqua green panel. The dashboard itself is black with just the right amount of variation by using different materials. The end result looks so good that the Corolla Verso feels more like a designer car than a people carrier. Still usability has not been forgotten, because the interior is just as practical as that of any other MPV. For this test drive the most luxurious version was used. This means that rain sensing windscreen wipers, automatic dimming mirror and cruise-control are all standard except for the above mentioned climate control system. Additionally the test car was fitted with features that can't even be found on more expensive cars. The first of those is a parking camera. Over the image of the rear camera lines are projected that make parking easy. The "Cornering Assist Monitor" takes it one step further. This system uses two cameras which are mounted in a 25 degree angle on the front of the car. The colour screen on the dashboard shows traffic in crossing roads even before the Corolla actually crosses that street! Regretably this system does not project guide lines, making it less suitable to help entering small streets full of double parked cars. Of course an MPV is not all about the driver; the passenger are equally as important. Again Toyota has a nice treat in stall. The headrests of the front seats have monitors in the back, which makes it possible to enjoy a film on the backseat. The user friendliness leaves something to be desired, but once accustomed to the system picture quality certainly does not leave anything to be desired. Even in broad daylight the screens show a clear picture. The sound of the wireless headphones is excellent. In a compartment between the front seats inputs can be found to connect a game console. Moreover: both screens can be controlled individually, making it possible to watch a DVD on one screen and play games on the other. The audio system in the front also performs very well. Loudspeakers have been mounted in the extreme corners, creating a wide stereo image. On behalf of the test driver and passengers: our compliments to the entertainment division of Toyota! A theatre on wheels is optional, space is of course standard. Like in almost every MPV the windscreen is placed far to the front of the car over the engine. Therefore space is the front is comparable to most other cars in this segment. Access to the backseats is easy thanks to a remarkably large door. This is necessary because behind the backseat is, depending on the trim level, a second backseat. This first backseat is separated into three parts, each of which can be adjusted. The second backseat can be hidden in the floor. In one easy move two extra seats raise from or can be hidden in the floor. When the first backseat is slided a little forward, room on the second backseat is reasonable. Because the cushions of the second backseat are barely higher than the floor of the car, both children and grown ups have to sit with their legs pulled up. The full size headrests and three point safety belts really contribute to safety on these last two seats. Behind the second backseat the boot only leaves room for a shopping bag. When using only one backseat, the boot is huge. The "Easy Flat 7" system makes it possible to create even more space by folding the first backseat in the floor as well. The folding system is easy and intuitive to use. Without consulting the owner's manual, on the first try the seats where folded neatly into the floor. Removing the seats or endlessly fooling around with springs and brackets is not necessary. The unique character of the Verso raises the question why this new car is still called "Corolla". The resemblance can be found in the ride quality. The Corolla Verso is just as manouverable as the hatchback. Toyota spent a lot of time in developing the suspension. This eliminates many of the known drawbacks of a high car. Anything goes and even when the limits are reached intentionally, the Verso still remains easy to control. Only when braking very hard the Verso cannot mask the fact that it is a big and heavy car. The test car is equipped with a 1.8 litre petrol engine. Staying true to its character, this modern car is not started with a key but with a starter button. After pressing the big red button 130 horsepower come to live, giving the Corolla Verso good performance. Sprinting power is average, but the engine excels in torque. Both in city driving and on highways lazy drivers can forget about shifting gear once in a while. Even at low revs, the engine still has enough power to perform. The Corolla Verso feels most at home on the freeway. Tyres, engine and wind hardly create any noise, making this car very comfortable on long journeys. However, fully loaded with seven people and/or their luggage, the diesel engine is a better choice. The city of Sevilla in Spain was the destination of this test drive. A beautiful city full of wide boulevards, stately buildings and impressive palaces. Perhaps an idea for the next holiday? With the Corolla Verso the whole family can come along! The Toyota Corolla Verso drives like a normal Corolla. The new car is expected to be as reliable and problem free as the normal Corolla. But the Verso takes it one step further with modern technology and luxury that cannot even be found in more expensive cars. Compared to its competitors the Corolla Verso isn't only spacious, but its space can be fully utilised thanks to the Flex7 system. The driver has not been forgotten, because driving quality comes close to that of a normal car. Therefore the test drive took the car one step further and that went very well!